" CONTROL PAIN AND IMPROVE QUALITY AND QUANTITY OF LIFE "
* Harmful and undesirable effects on all systems of the body. This leads to personality changes such as irritability, depression, loss of sleep (Insomnia) and even high blood pressure. * Chronic backache or headache affects the work capacity and productivity of every-one and more so of a professional or executive. * Loss of million working hours (Absenteeism) leads to heavy financial burden of society, at large. * Myofascial Pain- Tennis Elbow, Frozen Shoulder, Tort Collis. * Any Pain lasting for more than six months. Introduction - Pain relief is basic human right. The chronic pain has many aspects such as nociceptive, somatic, visceral, neuropathic, musculo-skeletal and psychological. The ultimate result of chronic pain lead to reduction in quality of life apart from physical and psychological disturbances. That’s why it is mandatory multimodal approach to have total pain relief. This will help the patient and family in toto with reduction in side effects of medication, confidence and overall improvement in quality of life. in simple term it relieves pain and are divided in to Non-narcotic and Narcotic groups. Non-narcotic-means it relieves pain without causing drowsiness or sleepiness. They are Paracetamol, NSAIDS (Diclofenac, Aceclofenac, Ketoroalac). Narcotics - mean it relieves pain but has side effects like drowsiness; sleepiness; nausea and vomiting; constipation and itching. The common drugs used for pain relief are Codeine, Morphine, Fentanyl, Buprenorphine and Tramadol. The movement of food along your gut (intestines) happens because some of the muscles in the gut tense (contract) and then relax in a regular pattern throughout the length of the gut. These muscle contractions are brought about by various chemicals produced by your body which stick to special 'docking' sites (receptors) on the muscles. 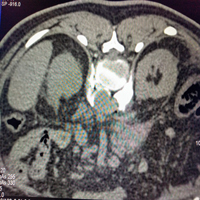 The tumour in abdomen results in constant spasm of intestine and other structures. The drugs like Dicycloverine , Hyoscine, Atropine, Propanthelin. act on nerves and helps in healing of nerves. They also relieve neuropathic pain such Carbamazepine, Gabapentin, Pregabalin. It reduces depression and increases will power to fight against pain. The commonly used one are Amitryptalline, Nortriptyline. It reduces anxiety again to increase will power and reduces side effects of anxiety such as rise in pulse rate, blood pressure and decrease blood sugar levels especially in diabetic patients. The use of multiple medications may lead to hyper acidity symptoms. The drugs used are Omeprazole. Pantoprazole, Rabeprazole. Nausea is the feeling of having an urge to vomit often called as sick stomach. Vomiting or throwing up is forcing the contents of the stomach up through the oesophagus and out of the mouth. Drugs Ondansetron, Phenergan, Promethazine, Metoclopramide, Ativan, Prochlorperazine, Reglan, Dramamine. Destruction of muscles, tissues and nerves leads to pulling sensation, spasticity. Drugs such as Baclofen is used. Constipation is an irritating and disturbing symptom. 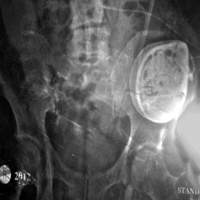 It means difficulty passing stool, is a common digestive complaint and is a symptom of gastrointestinal abnormalities. It is common side effect of pain medications and its treatment is often challenging one. and preventing constipation is done by treating underlying disease. The drugs are Bisacodyl and Senna- stimulant laxative; Docusate- stool softener; Glucomannan- dietary fibre; Lactulose- is a purgative and laxative; Lubiprostone- for chronic constipation and irritable bowel syndrome; Magnesium sulphate and Sodium Pico sulphate-is a contact laxative. They are available in tablet, suppository, powder or liquid form. Such as Dulcolax Cremaffin, Castor oil, Dufalac. 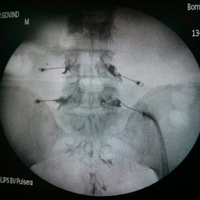 Pain block is injection of pain killing drugs in or around the nerves, ganglion or plexus (nerve bundle). The nerves are thread like structures which carry pain and touch sensations, so we feel touch and pain. The pain killing or relieving drugs reduces only pain sensation from nerves to cause pain relief. 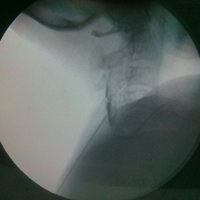 The pain blocks are done under guidance of fluoroscope, CT scan or ultra sound. The medication used are local anaesthetics such as Xylocaine, Bupivacaine, Ropivacaine; neurolytic agents such as Alcohol, Phenol in Glycerine or Almond oil. The steroids such as Triamcinolone Acetonide, Dexamethasone, Depomedrol act as anti-inflammatory agent to reduce inflammation and swelling of nerves. 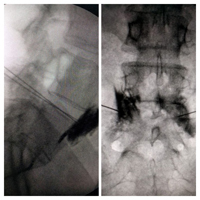 Radiofrequency Ablation - is very precise and safe method to be used in ablating nerves such as median nerve for facet joint pain or trigeminal nerve for trigeminal neuralgia, sympathetic pain for ischaemic pain. It works on principle to deliver temperature 42o enough burn/destroy the tissue which results in relief of pain. Cryoablation - is a procedure of ablation or destroying of nerves by freezing which results is temporary damage and prevents sending of pain signals to brain, to cause pain relief. 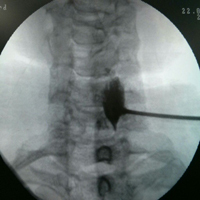 Spinal Cord Stimulation (SCS) - it masks pain signals before they reach the brain. 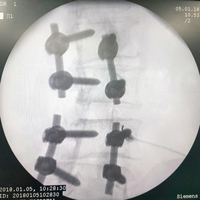 It has electronic lead which is put epidural space and connected to electronic device, such as a pacemaker. It is implanted in the back which delivers mild electrical stimulation nerves along the spinal column to modify or block nerve activity. It is a non-medicinal way to minimize the sensation of pain reaching the brain. It is useful for nerve damage in the trunk, arms, or legs. It is used in patients still in pain after back surgery or other treatments have failed. Verterbroplasty & Khyphoplasty - are procedures used to treat painful vertebral compression fractures in the spinal column, due to osteoporosis. 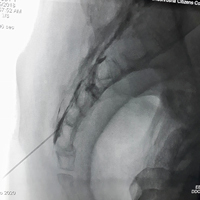 These procedures are done under fluoroscopy and inject a cement mixture into the fractured bone through a hollow needle. 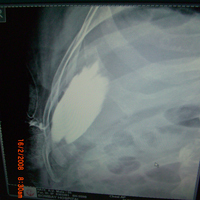 And in Kyphoplasty, first a balloon is inserted into the fractured bone through the hollow needle to create a cavity or space. The cement is injected into the cavity once the balloon is removed. once pain relief is done patients are reffered for physiotherapy. The various modalities such as short-wave diathermy, exercises, laser, traction and many more are used. Which is for improvement in muscle tone, decreasing of rigidity and spasm to increase mobility, increase in blood supply and muscle activity. A rehabilitation program also provided as per need of individual patients. Emotional disturbances goes hand in hand with chronic pain. For symptoms like depression and anxiety are mentioned above. Pain has many components so following alternate therapies acts as supportive to total pain management. Acts as good diversion from pain and relaxed mind will help in reduction in dosage of medication.